PE4986 3.5mm female bulkhead coaxial connector has an interface type of PE-SR405AL, PE-SR405FL, RG405 and a 50 Ohm impedance. Pasternack 3.5mm female bulkhead connector uses shield/contact clamp/solder as an attachment method. Our female 3.5mm coaxial connector provides a minimum frequency of DC and a maximum frequency of 32.5 GHz. 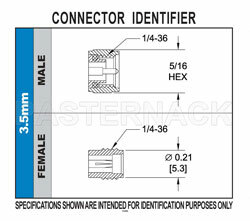 The Pasternack 3.5mm female bulkhead coaxial connector has a ppo dielectric type and a VSWR of 1.25. 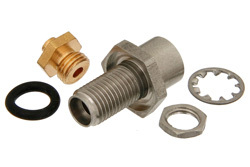 The Pasternack 3.5mm coaxial connector has a passivated stainless steel body. Our PE4986 3.5mm connector uses beryllium copper contact. This 3.5mm female bulkhead coaxial RF connector is RoHS and REACH compliant.